Now that I’ve finally made the leap to install Windows Vista on my home computer, I thought it might be useful to dig through some old (and new) guides to keep Vista from annoying me as much as it did when I first tried it out in beta. Luckily, things are going much more smoothly this time. Here’s a helpful tip from the How-To Geek about how to run a command as an Administrator from the Vista Run box. 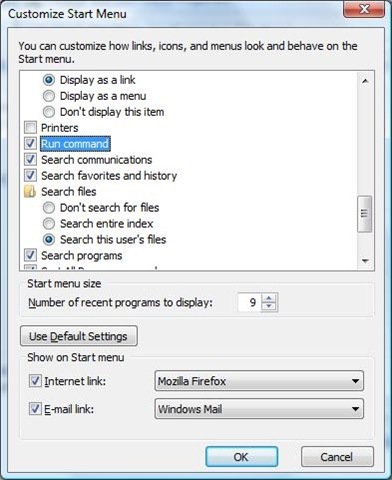 Right click on the taskbar, then choose properties. Scroll down to the “Run command” option, and check it. Now instead of hitting the Enter key, use Ctrl+Shift + Enter. You will be prompted with the obnoxious User Account Control dialog… but it will then open up a command prompt in Administrator mode.